This combined program consists of 320 clock hours of instruction which provides comprehensive training in permanent hair removal. 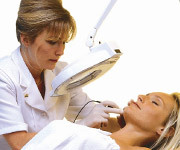 Theoretical training covers the biological study of the foundations of skin and hair, and the modalities of Thermolysis, Electrolysis, the Blend, and Laser and Light Based Hair Removal. Students will receive theoretical training and be tested on the following subjects: Anatomy, Endocrinology, Bacteriology, Dermatology, Sterilization, Electricity, follicle insertions and treatment. Demonstration and practical training on the latest computerized equipment will be provided. The curriculum will be presented in the form of lecture, class assignments, hands-on demonstration, student participation, theory and practical testing, class discussions, audio-visual aids and other related learning methods. Upon successful completion of this program, graduates will be eligible to apply for licensure in the State of Florida. The Institute is also able to provide training to students who wish to practice outside the State of Florida with modified training programs that adapt to their state requirements. The Institute can assist in the selection of equipment necessary to practice electrolysis, and/or attempt to help place graduates per their request.